It is widely recognized that La Liga, Premier, Bundesliga, Ligue 1 and Serie A are the elite of European football but each one of them has its own distinctive characteristics, those signs of identity that make them unique and that, beyond the level of the squads and the resources available, allow us to identify common patterns even in styles of play different from each other. In Driblab we wanted to investigate these differences between the five major leagues. In this post we are going to see what characteristics the shots have in each league and how they differ from each other to end up reaching a common conclusion to all of them. Distance is not everything, but it is one of the indicators that influence the evaluation of expected goals and the probability of a shot conversion. 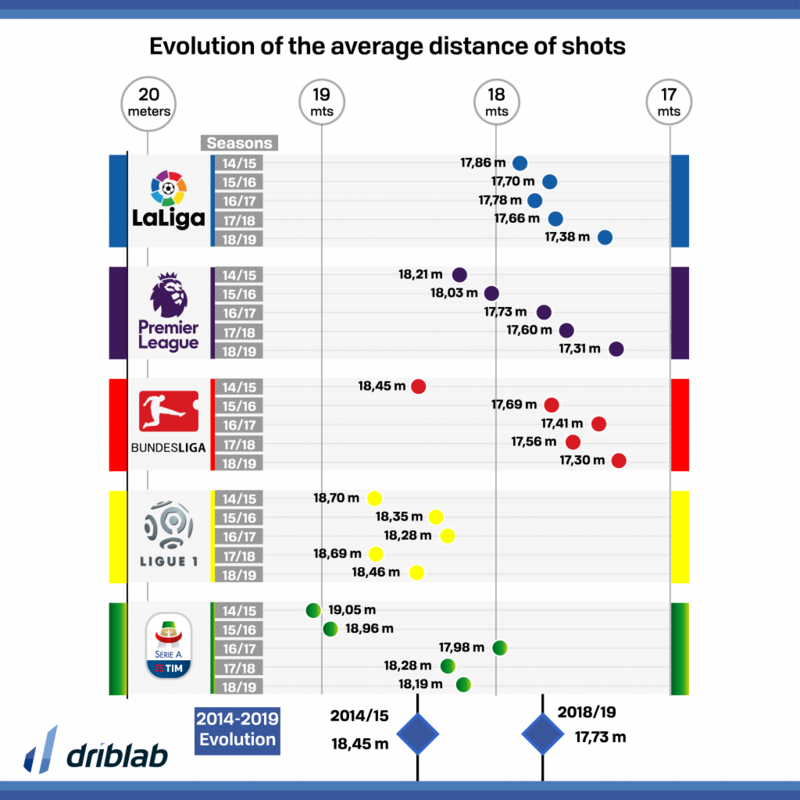 Analyzing the average distance of the shots and the evolution of them we see that La Liga and Premier Legue are the competitions that in recent years have had the closest average distance to goal per shot. A good reflection of this evolution towards finishing from closer is the adaptation of the Bundesliga. 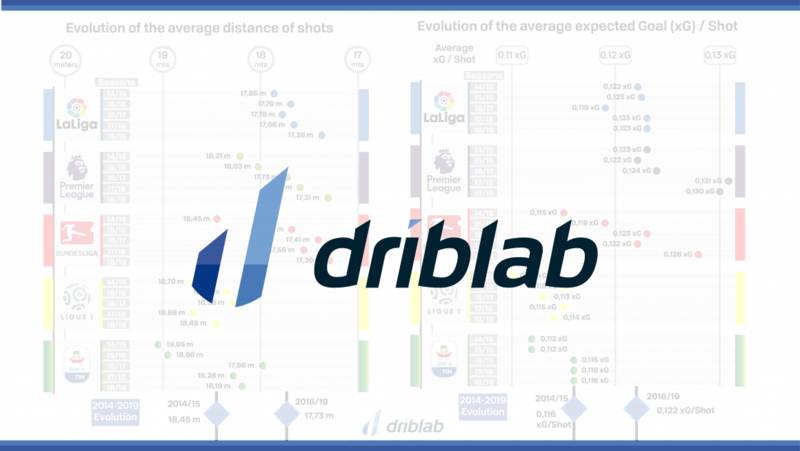 The average distance of the shots has gone from 18.5 meters to 17.7 – the box ends at 16.5 meters – and in all five leagues is now shooting closer than since 2014/15 is when we began to analyze. It is clear that Ligue 1 and Serie A follow other patterns: in Ligue 1 you shoot from a meter further away than in England or Spain. 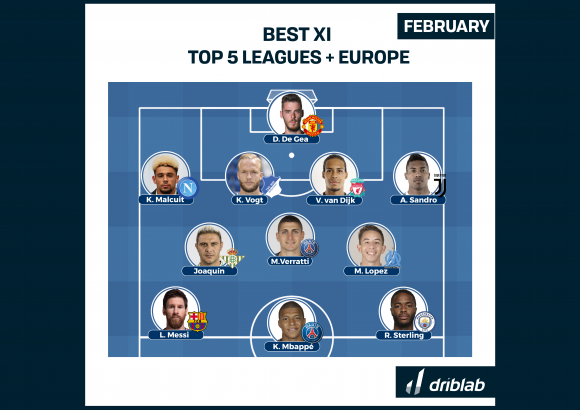 All this has a direct relationship with the expected goals per shot in each league. 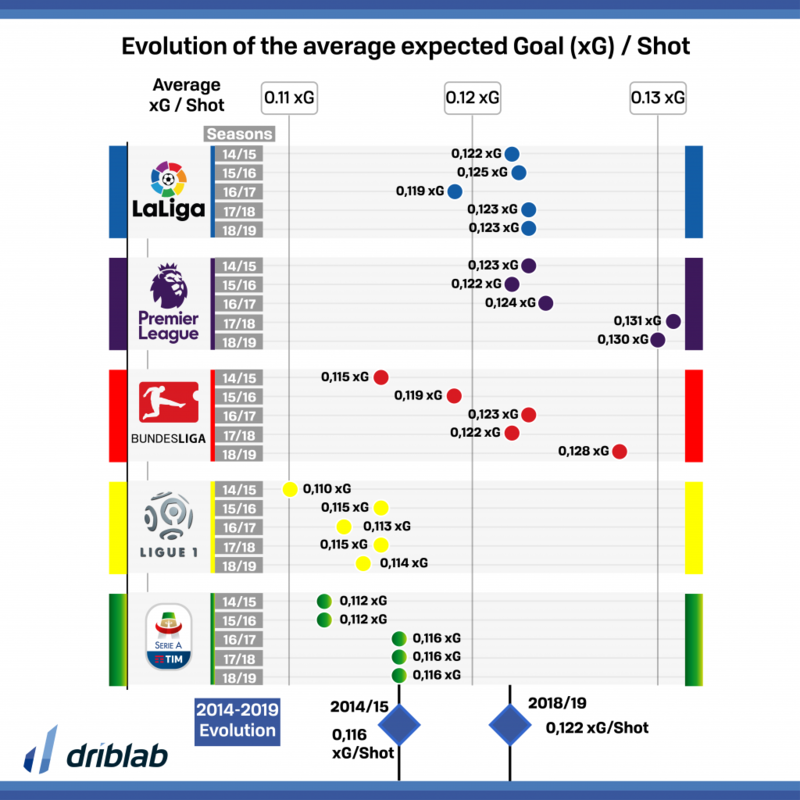 As we can see, this tendency to shoot from closer is linked to the number of goals expected per shot and this selection of shots shows that in La Liga, Premier League and Bundesliga each shot is more likely to end in goal scored while in Ligue 1 and Serie A that figure is below 0.12 goals expected per shot. The tendency to shoot from closer is also accompanied by a shot with a greater likelihood of a goal. Each major league has its own conditions and characteristics but they all follow a very clear pattern in the distance and probability of each shot.